2017 EQMM Readers Award! Congrats to all! Brendan DuBois has taken first place with his story “Flowing Waters,” a timely and poignant tale of a veteran and her dog from our January/February 2017 issue. The New Hampshire native got his start in EQMM’s Department of First Stories in 1986. Since then he has produced 165 published short stories and nearly two dozen novels, as well as collaborated on books by New York Times best-selling author James Patterson. He’s a Shamus Award winner and an Edgar, Macavity, and International Thriller Award nominee. Doug Allyn rings in second place with his story “Tombstone” (November/December 2017), which combines the lore of the Old West with modern filmmaking intrigue. The author, who hails from Michigan, has won more Readers Awards than any other writer. He’s also a multiple Edgar Award winner in the short-story category, and the author of a number of well-received novels, several of which had their genesis in his stories for EQMM. In third place is Dave Zeltserman with a new entry in his Shamus and Derringer Award winning Julius Katz and Archie series (a Nero Wolfe homage): “Cramer in Trouble,” from the March/April issue. 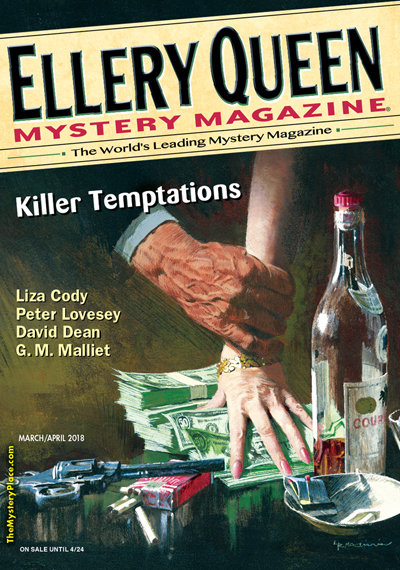 Before beginning this series—stories from which have twice before won EQMM Readers Awards—Dave Zeltserman was known primarily for noir fiction. He is the author of Small Crimes (now a Netflix Original movie) and the Morris Brick series (written under the pseudonym Jacob Stone). You can read more about these authors and their work, and see the runners up, in the May/June 2018 issue of EQMM.